My name is Mya, and I am a sweet older girl. 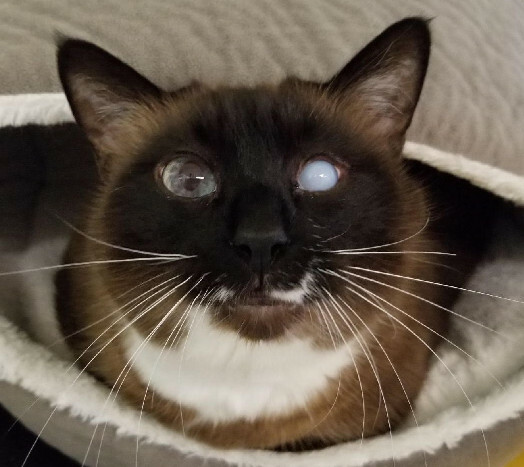 As you can see in my pictures, I am a beautiful seal point Siamese. I am also blind in one eye. No one knows exactly what happened to my eye, as it was in this condition when the HSCC pulled me from Cobb County Animal Services, but the vet thinks I suffered some sort of blunt trauma. In any case, it doesn’t bother me or hold me back, and really it just adds to my charm! I am a lap cat who loves to cuddle and loves to be brushed (which I do require regularly). I can be sassy, and I also experience bursts of energy at times, despite my mature age! I do need to lose a few pounds and would appreciate a family who would help me with that. I am extremely particular about my litter box and require that it be clean at all times! I become deeply and truly concerned if my box is the least bit “icky” and will take the matter into my own paws. I would thrive as an only pet in a loving home, and would probably be fine with one other mellow cat, but I would prefer no more than one feline companion.